Slow Cooker Red Beans and Rice Recipe – A traditional Creole red beans and rice recipe that everyone loves made easy in the slow cooker! 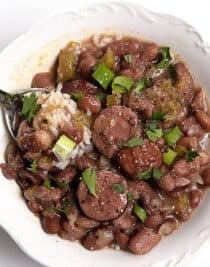 Red beans and rice, it is definitely always a family favorite meal at my house and one that is comforting and delicious. I remember growing up that Mama would make it for special meals when she knew that she would be home all day so that she could tend to it on the stove, having to make sure that she kept plenty of liquid in the Dutch oven so it didn’t scorch. Now, I just take about 5 minutes to toss everything for the red beans into the slow cooker, set the timer and walk away. No need to babysit the pot or hover around the kitchen. Talk about easy! This remake of a family favorite goes down as a definite win in my book! To make my easy slow cooker red beans and rice, I start using dried red beans. I rinse them and pick through them to make sure they are clean before adding them to the slow cooker. If you prefer, you can soak your dried red beans overnight, but I’ve found that they still are just as delicious without soaking them when I cook them in the slow cooker. To the beans, I also add in my smoked sausage, celery, bell pepper, onion, garlic, Worcestershire sauce, salt, chili powder, and water. For the smoked sausage, you can use a spicy andouille sausage or a milder version based on your preference. I will say that when I serve this to guests, I make sure to use a milder variety since the spiciness of andouille sausage might not work for everyone. If you aren’t sure, I would suggest going mild to begin with but trying it with the andouille at some point too! Once you add the water, stir all of the ingredients together so that they are well combined, pop the lid onto your slow cooker and set the timer for 6 hours on high. You may need to adjust the time for your specific slow cooker, but I’ve found that the beans are tender at 6 hours on high in my 6-quart as well as 7-quart slow cookers. Test the beans to make sure they are tender by gently pressing one alongside the side of the slow cooker insert. If ready, it will give to the pressure. If not, replace the lid on the slow cooker and cook in 30-minute intervals on high until tender. 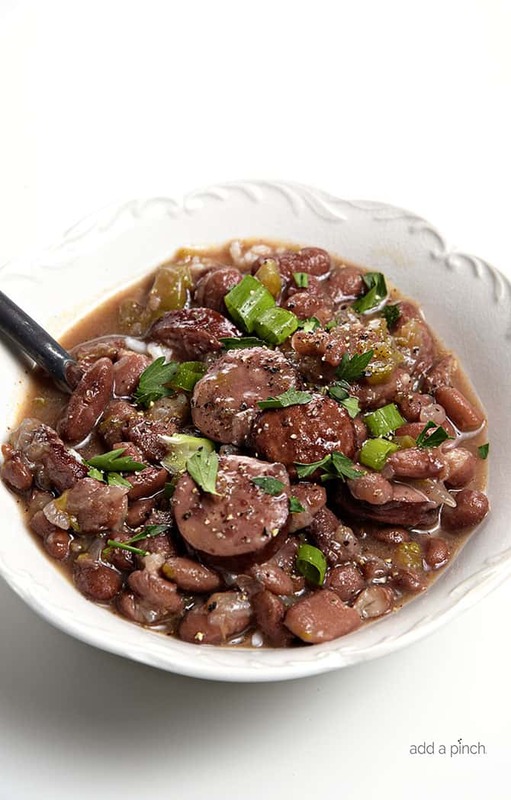 Once the beans are cooked tender, give your red beans another stir to combine all of the flavors. I have to say, it is mighty hard to resist this big pot cooking away throughout the day. The smell is out of this world! As the red beans are finishing, cook your favorite rice according to the package directions. 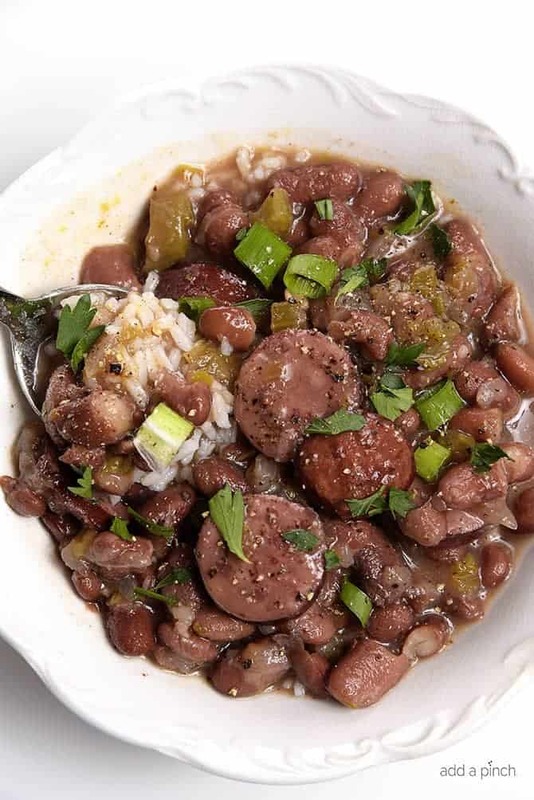 Add rice to each serving bowl and top with a ladle filled of the red beans. Then, top your red beans and rice with green onions and parsley for serving and devour! 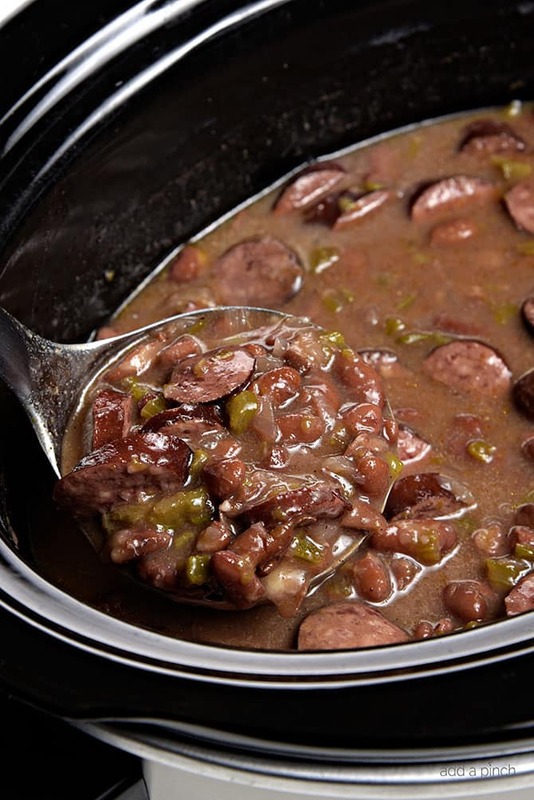 Here’s my Slow Cooker Red Beans and Rice Recipe. I hope you love it as much as we do! 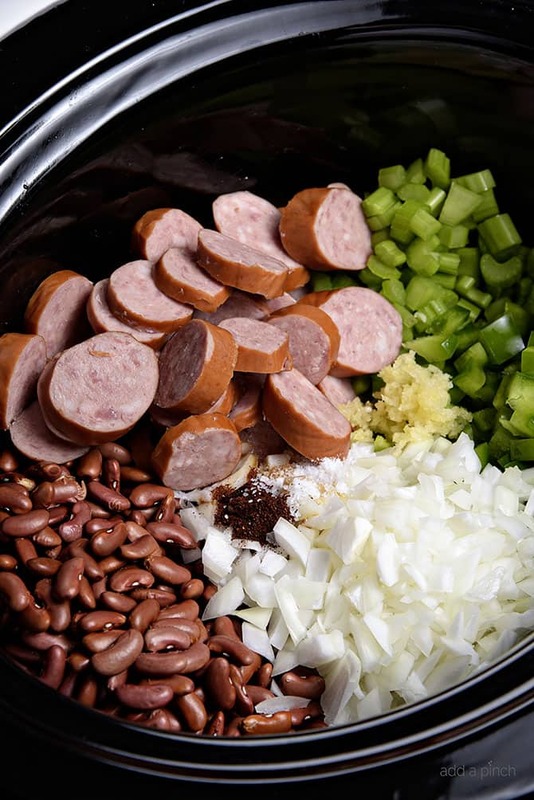 Add red kidney beans, smoked sausage, celery, bell pepper, onion, garlic, Worcestershire sauce, salt, chili powder, and water to a 6-quart slow cooker. Set on high setting and cook for 6 hours. Serve red beans over top of the cooked rice. Top with fresh green onions and parsley. Looks delicious. How can I substitute canned for dry? please. Oops, sorry. Canned beans for dried. I made this today using canned beans, ( I used three cans) Cooked on low while I was at work, (5hrs) and it turned out fantastic!!! I dump the juice and all from the beans and did not add any water. I did add a little extra onion and meat! YUMMY!!!!! I will be making this often. 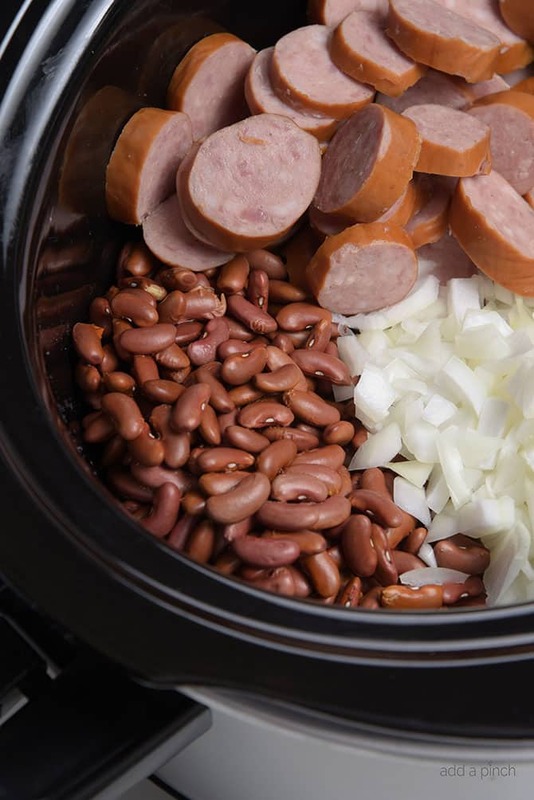 Do you need to soak the beans before you put them in the slow cooker? You can if you wish, but it’s not necessary. I describe this in the blog post in more detail. Thanks! I followed this exactly without soaking and at 7 hours on high they were still hard! Not even a little give. Had to make eggs for dinner. I’m curious if anyone else has experienced this? Jaimie, if your beans are old, they will not cook properly and will stay hard no matter how long they are cooked. Dry beans can be stored up to a year in an air tight container and stored in dark place like a cupboard. in order to double the recipe, how much additional water needs to be added, if any? Also, how many servings doe this recipe provide? This recipe serves 6-8. I’ve not doubled this recipe before. Enjoy – it’s delicious! Thanks so much! Thank you. 6 to 8 generous portions? Can I replace with canned beans and does this adjust the cooking time or amount of water needed?? Looking forward to making this tomorrow. 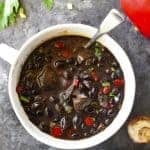 I use dried beans because I like the flavor the dish gets from everything cooking together in the slow cooker as in the recipe. I hope you enjoy this! It’s a delicious favorite in our house! Thanks! Mine turned out pretty watery. Is there anything I can do to fix that? Using a crockpot or cooking the beans on the stove. When the beans soften, usually you mash some beans to thicken it up. Start with a big spoonful and mash them, continue to mash beans until you get the consistency you desire. This was awesome. I just substituted 3.5 cups of water for 3.5 cups of chicken stock. My mom now asks me to make these all the time. Thank You! So glad you like this Olivia! Thanks so much! This real simplified version tastes like more complicated versions….GREAT!!! Can it be cooked on low, how long? Yes, you can cook it on low. I would try about 8 hours. I made and instead of water I used 3 cups of chicken broth and 4 cups of water. I also added some diced jalapeños… After it was on high for 6 hours, it was so bland! No flavor at all! I ended up adding some red wine vinegar and then some creole seasoning and it perked right up! Made them yesterday and they were awesome! I used 4 cups of chicken broth and 3 cups of water. A little funny and next time may reduce liquid to 6 1/2 cups. Oops…. Runny not funny. …. Could this exact recipe be made in a 5qt cooker or would I need to reduce the ingredients ?? I think you should be fine to make in a 5 quart slow cooker. Glad I tried it, but I wasn’t impressed by this one. It was very bland — I added some Cajun seasoning and more chili powder to give it some spark. Added more garlic, too. The long cooking in the pot reduced the veggies to nothing — I’m guessing they would have been happier with 2 or 3 hours. Fixed up, the flavor was good, but I’ll go back to making this on the stove. Next time I make RB & R I will cook the beans in the crock pot, though. They were much better than canned — richer flavor. I’m sorry you didn’t enjoy it Mike. Some sausages are spicier than others and the garlic and spice amount in the recipe is plenty for some, but you can definitely add more spice if you wish. Since I use dried beans in this, I find that it takes the time on the recipe for the beans to get done. I don’t think the 2-3 hours would be enough. Thanks! Thanks for the reply. By “veggies” going 2-3 hours I meant the Pepper and onion, which seemed way over cooked. The beans cooked up fine. I used a kielbasa sausage, same style and brand I would typically use. 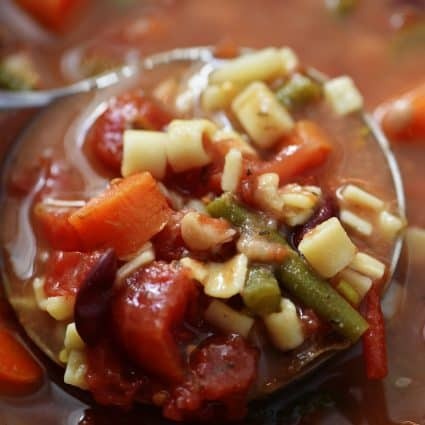 Actually, the vegetables are not supposed to stay chunky like a stew. 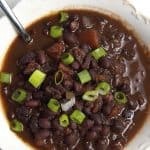 I’m following the recipe and using a slow cooker on high as recommended, though I did do a “quick soak” on the beans because I have had hard beans before. Be sure and check your date on the bean package, as a lot of store stockers don’t necessarily check dates. Remember every cook uses what they have on hand, adjusts to their own preferences, and don’t take it seriously. This stuff was cooked in the pioneer days! LOL. This looks great! How would you recommend modifying this recipe for an 8-quart slow cooker? so I poured it into a sauce pan, added 2 TBS of flour and made a roux and combined it with the bean broth and bean mixture… and then added the cooked rice. I was pleased with the taste and consistency. I followed the recipe exactly but I found it came out too watery and although the smoked sausage added flavor to the liquid, the sausage itself was flavorless and the final product was a little too bland. I’m sorry it was a little bland for your taste, Robin. Some sausages are spicier than others and the garlic and spice amount in the recipe is plenty for some, but you can definitely add more spice if you wish. Thanks! My family loved this recipe. Just like everyone else, I did tweak it a little (every cook has to make a recipe their own, right?) I browned my sausage beforehand, added some creole seasoning and added in some country ham pieces for seasoning (I always add ham to my beans). It was the perfect comfort food. Cooking times were perfect. I’m doubling it tonight and am going to try freezing some. Thanks so much! 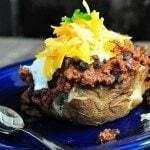 Made this recipe, love cooking in my slow cooker. Easy using dry beans. I did use 1 lb. of spicy sausage. Delicious! I live in California and unfortunately never had “real” RB&R before. Tried a few other recipes, but yours by far has been the best, but I’m not an expert. I like my food REALLY spicy so next time I think I’m going to go with andouille sausage. Glad you liked it Chris! Thanks! Great recipe. Very delicious. I did add a few whole bay leaves and a 1/4 tsp of cayenne pepper, and used a quart of vegetable stock in place of 4 Quarts of the water. I did soak the beans and rinsed them before use. This really helps for eliminating the bean flatulence problem. I also preheated the cooker liner by filling it with really hot tap water and dumping it before use to speed things up and heated up the vegetable stock in a saucepan before adding. Then boiled the remaining 3 qts of water before adding and sautéed the vegetables in olive oil (softened but not browned) before adding. I realize these extra steps are not really necessary but they do get things cooking faster. I will make this recipe again, it is a keeper. Thank you. 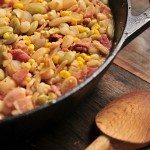 This has been my go to red beans and rice recipe! I just use canned beans and add a can of Rotel tomatoes for some added flavor. Delicious! This is from a true Cajun too. Made this recipe tonight, and it’s a keeper. The only thing I did different was to make a roux, and mix it in at the end. Made it just a little thicker. Thanks so much for sharing this recipe. I made this in my dutch oven due to lack of time. It came out amazing! Next time I would add more sausage.